What happens to the energy stored in a circuit as you increase the number of capacitors connected in parallel? Series? This is College Physics Answers with Shaun Dychko. We're going to figure out what happens to the energy in the system as more capacitors are added to the system. And, the first case, it will be added in parallel. And, in the second case, they're going to be added in series. So, we're going to ask: How does the capacitance of the circuit change as additional capacitors are added in parallel, and versus how does the capacitance change as more capacitors are added in series? And, that capacitance will affect the amount of energy stored in the system because the energy will be the capacitance times voltage squared over two. And so, as capacitance increases, then the energy will be increasing. And so, let's see what happens. Now, when capacitors are connected in parallel, the equivalent capacitance is going to be the direct arithmetic sum of each capacitance. And so, as the number of capacitance increases, the total capacitance increases. Why is that pointing down? That should be pointing up. There. So, this is C with two parallel lines to say the total capacitance when connected in parallel. And so, as the number of capacitors increases, so does the capacitance. 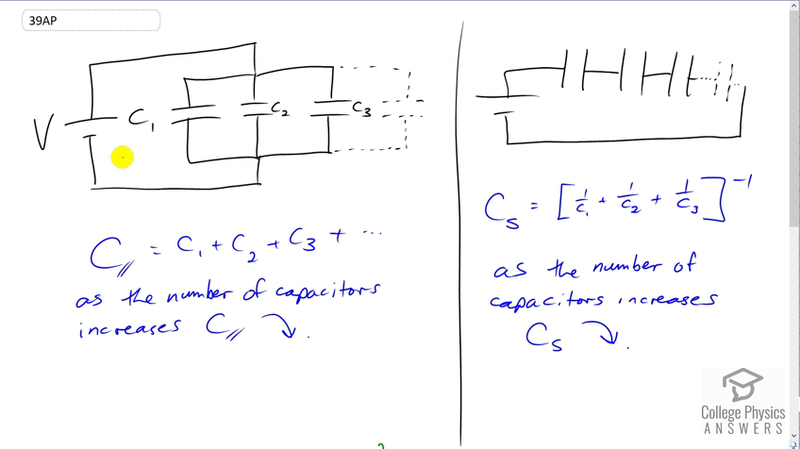 Now, in series, it's a different story because to find the equivalent capacitance for capacitors connected in series, you take the reciprocal of each capacitance and then take the reciprocal of that sum. Now, so this total, after doing all the arithmetic operations there, will be decreasing as you add more terms in this series inside. And the way you can tell is because you're going to be getting an increasingly large number in brackets here as you add another fraction, one over C four, whatever the number that is, plus one over C five, and so on. You're going to be getting a larger and larger number, and then when you take the reciprocal of that larger number, you're going to end up with a smaller number. So, the greater number you start with inside the brackets here, the smaller will be your result after you take the reciprocal of it. So, as the number of capacitors increases, this total capacitance decreases. And so, energy being in proportional to the capacitance, when in parallel, the energy is going to increase as you add capacitors, since the capacitance is increasing. And for series, the energy will be decreasing as you add capacitors since the total capacitance is decreasing. And, that is option B. Increases, decreases.